PeakNation™, get ready for the Colorado Lefties to seize just upon the top line from the latest NBC News/ Marist poll, but should they dig at all beneath the surface, these numbers have to have them worried. 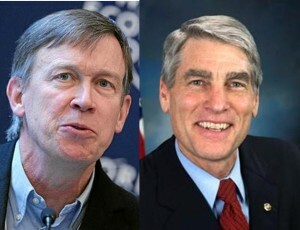 Essentially, the race is unchanged for the Senate seat, as Sen. Mark Udall held a seven point lead over Rep. Cory Gardner among registered voters in July (48-41), and holds an eight point advantage now (48-40) (48-42 among likely voters). What those numbers don’t say is how this most recent poll by Marist is weighted quite drastically different than the poll they released in July. In the July poll, the voter breakdown among registered voters was 32% Democrat, 37% Republican, 30% independent. However, now in September, Marist uses a voter breakdown of 32% Democrat, 32% Republican, 30% independent. And, this is why Udall has to be worried: In this most recent poll, Marist took away five points from Republicans when they weighted it, and the topline numbers were essentially unchanged since July. Should Marist have used the same voter breakdown they used in July, the story would be how Gardner closed Udall’s lead. For Gov. John Hickenlooper, the story is even more bizarre. The Marist poll in July had him sitting at 49-43 among registered voters against former Rep. Bob Beauprez. Since then he’s dropped to 43-36 among registered voters. And, more disturbing, he’s sitting at 43-39 among likely voters. Beauprez has closed the gap between him and Hickenlooper, even after Marist weighted five points less for Republicans. So, to all you Colorado Lefties out there, please crow as loud as possible about this poll, because, trust us, the next few polls are going to be ugly for you guys. Because a paycheck is better than a handout. Paychecks can be raised – handouts eventually dry up. It's a sad fact that many people, especially in the south, vote against their best interests. For example, we have a Medicare thieving criminal in the Governors mansion, who is against everything that's good for this state, but recent polls show he's ahead of his opponent for the November election. His opponent is no pillar of perfection either, but he's a helluva lot more honest. That's some high-intensity spin there – an eight point lead for Udall is "essentially unchanged", and great news for Gardner. And have you noticed that your numbers for September only add to 62% total? Some of us can add. We can also look up original sources, and your numbers for Independents are wrong for both July and September. Unless you belong to the ones who are considered the wealthy 2%, please explain why anyone would vote Republican, knowing it would be detrimental to their well being.